Liebherr has successfully wrapped up it's impressive 2018 Customer Days event at its mobile crane facility in Ehingen, Germany. Established in the early 1990s and taking place every three years, the Customer Days event has grown substantially. 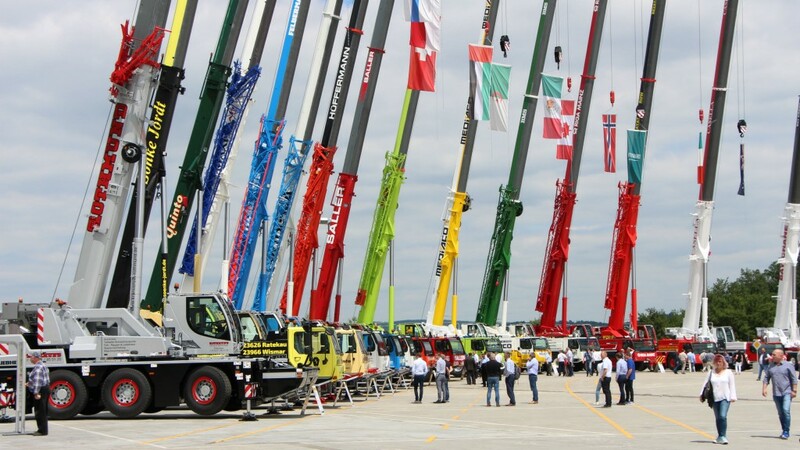 This year 3,000 customers from over 80 countries descended on the sprawling factory grounds to see first-hand the impressive range of cranes on display. A highlight of the event was a comprehensive machine demonstration showcasing the latest in Liebherr's crane innovations. Liebher used the occasion to underscore its re-entry into the rough-terrain crane market, which it originally announced in 2016. The company showed off two models: the LRT 1090-2.1 and the larger LRT 1100-2.1. Liebherr unveils the five-axle LTM 1230-5.1 at its customer days in Ehingen. Liebherr also presented its new LTM 1230-5.1 mobile crane. The new 230-tonne crane not only delivers an extra three metres in length to its boom but also an average of 20 percent greater lifting capacity. The LTM 1230-5.1 is the successor to the global success that was the LTM 1200-5.1. In its development work, Liebherr pursued the objective of increasing both the boom length and the lifting capacity of its predecessor. The result: the LTM 1230-5.1 delivers an extremely long telescopic boom and sets new standards in terms of lifting capacity. With lattice extensions, the maximum hook height has been increased by 10 metres to 111 metres. The new Liebherr LTM 1230-5.1 is an ideal crane for working on steep gradients and large hook heights, for example, for erecting tower cranes or maintenance work for wind turbines. Liebherr has a wide and variable range of lattice jibs for the new LTM 1230-5.1. The 11.5- to 22-metre-long folding jib can be mounted at an angle of 0 degrees, 20 degrees or 40 degrees. The folding jib can be supplied with a hydraulic adjustment system as an option which allows it to luff with a full load between 0 degrees and 40 degrees. The pivot point for the folding jib can be raised using up to three straight seven-metre lattice sections acting as telescopic boom extensions. For the last three years, customers with the LTM 1250-5.1 have been able to install a long fixed jib, the first of its kind in the five-axle class, to achieve enormous radii, for example, for hoisting over buildings. This lattice jib is also available for the new LTM 1230-5.1: a fixed jib up to 43 metres in length can be achieved with an additional TF adapter (connection between the telescopic boom and the fixed jib), a reducer section and a head piece. Existing lattice extensions are used for this purpose. This jib is generally hydraulically adjustable between 0 degrees and 45 degrees and can be used like a luffing jib. The existing parts can be used to assemble a particularly powerful jib up to 39 metres in length which is ideal for steep working positions. The maximum ballast for the new LTM1230-5.1 is 72 t, the same as its predecessor, but as a result of its VarioBallast, which can be adjusted from 4.8 metres to 5.7 metres, the lifting capacity at great radii has been significantly increased compared to the LTM 1200-5.1 and also the LTM 1220-5.2. The engineers at Liebherr-Werk Ehingen GmbH placed the multi-award-winning VarioBase support technology at the focus of the structural steel construction when creating the concept for the new crane. This meant that the new LTM crane is the first to have an asymmetrical support base – with the width being 7.4 metres at the front and 8.1 metres at the rear. VarioBase means that it is now possible to generate particularly high lifting capacities, particularly at the rear working area over the 8.1-metre-wide supports – calculated in real-time by the LICCON controller. A six-cylinder Liebherr diesel engine in the undercarriage which develops 400 kW / 544 bhp and torque of 2,516 Nm provides the LTM 1230-5.1 with all the power it needs. The engine already complies with the European Stage V exhaust emissions standard. The LTM 1230-5.1 also features the Liebherr single-engine concept which involves a mechanical shaft powering the superstructure. Gear shafts are routed from the distributor gear in the substructure via two miter gears through the centre of the slewing ring to the pump distributor gear in the superstructure. An add-on program in the drive concept ensures that the machine is particularly fuel-efficient. This means that the complete pump drive can be disconnected automatically when the engine is idling and then reconnected by the intelligent controller in a matter of seconds when it is required. Liebherr has also developed a special mode for mobile cranes in the load-sensing range to reduce the cost of crane operations while also reducing noise emissions. ECOmode minimizes both fuel consumption and noise emissions when operating the crane superstructure. The Big Hang – suspended in a "spider web," a Liebherr LRT 1100-2.1 rough-terrain crane. Liebherr LTM 1090-4.2 mobile crane. Liebherr remote operated LTC 1050-3.1 mobile crane.